Hello ... Hello ... my old friends ... It's great to see you once again! 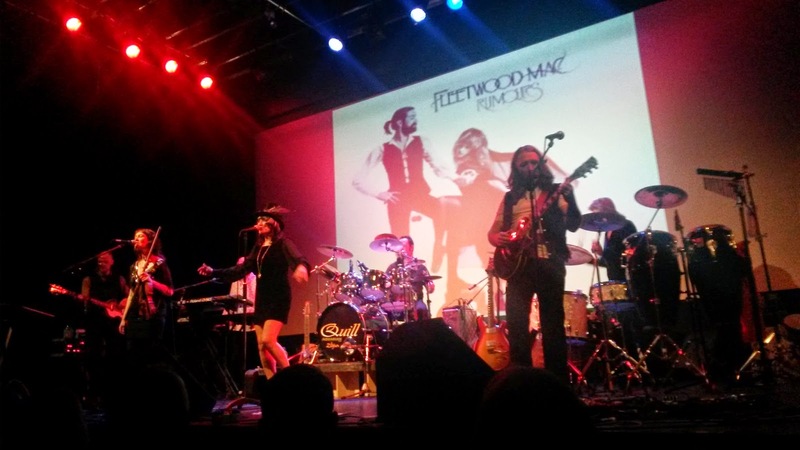 Quill arrived at the homely Ludlow Assembly Rooms in deepest, darkest Shropshire last night [Thursday 6th November] for the latest leg of their 2014/2015 theatre tour and delivered yet another top class and articulate live performance mixing their own exceptional material with interpretations of classics by the likes of Fleetwood Mac, The Eagles, Thin Lizzy, Led Zeppelin, Train and Steve Earle. This was the second occasion on which Bridgnorth based acoustic duo Cooper & Davies had been asked to share the stage with Quill and, once again, they were exceptional - especially with the added contribution of Graham Clews - and they produced an impressive set which included their own songs "Everything And More" and "I Never Said I Was Funny" intermingled with covers of "Bye Bye Love" [Everly Brothers] and "Cocaine" [Eric Clapton] amongst not a few others. 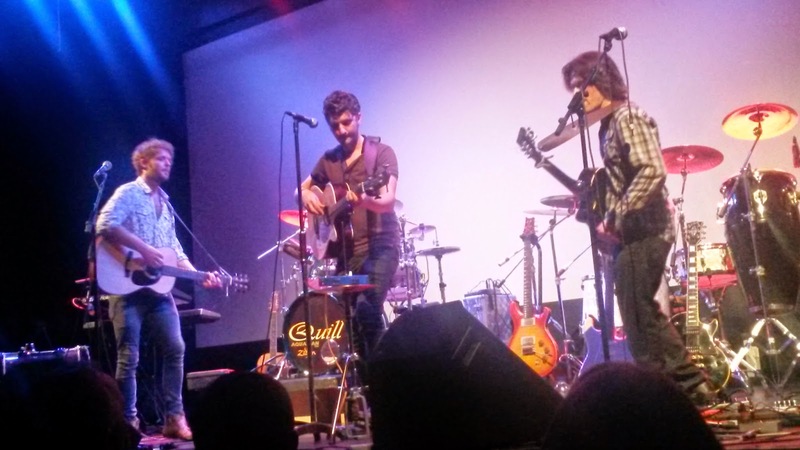 They looked and sounded assured on stage. always a good indicator of natural talent. Believe it or not, their 2013 EP: "The Coach House Sessions" has an ELO connection too as it is mastered by and produced by none other than: Rob Groucutt, who is the son, of course, of the late, great ELO, OrKestra and Orchestra bassist/vocalist Kelly! 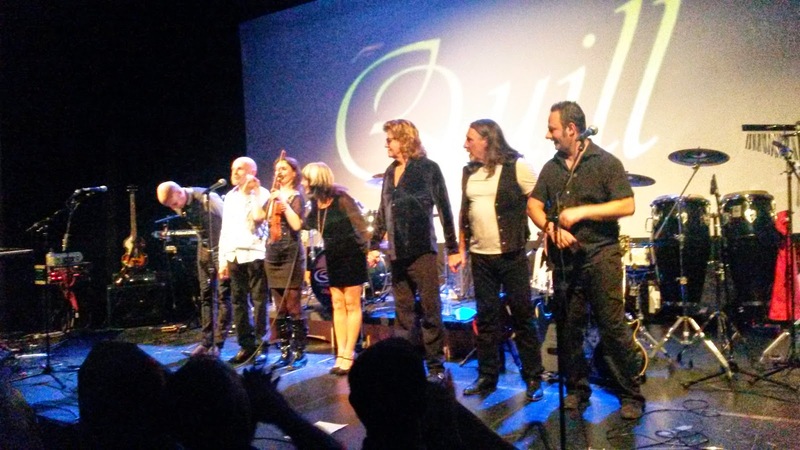 Quill again were supreme with another sublime and professional performance under their belt at the end of the evening. This time around one or three new things struck me. The first was the wonderful vocal range and clarity of voice of Matt Davies, particularly with his lead on "Drops Of Jupiter". The second was the relative ease with which Tony Kelsey has slotted into the bands identity with his stunning guitar craft. 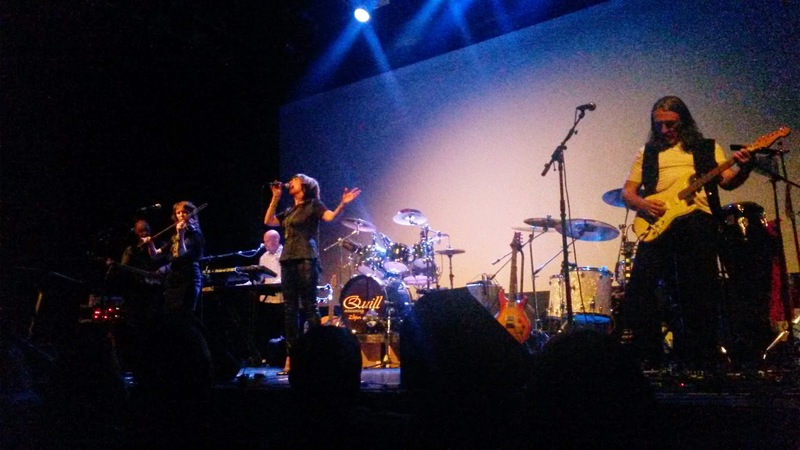 And the third was the absolutely thrilling synchronicity of drummer Tim Tandler with percussionist Bev Bevan. At times they were almost as one giving me a good idea of the concept of the sound that twin drums can add to a band - as they did with Wizzard, for example. Add those facets to the wonderful talents of Joy Strachan-Brain, Kate McWilliam and Dave Bailey, and you then begin to understand what endears Quill to their loyal fan base and what has kept them at the top of their game over what is now four decades. 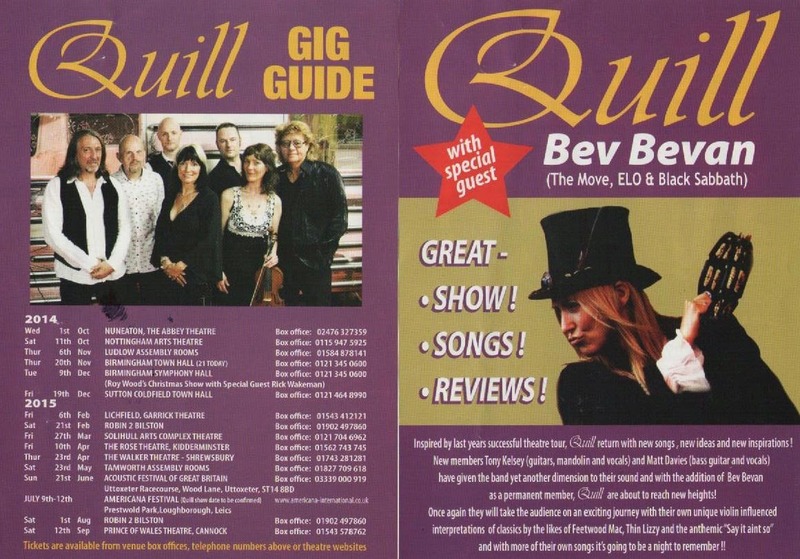 Quill set list: "Tumbling Years"; "Stairway To Heaven"; "Take It Easy"; "Duelling Banjos"; "Say It Ain't So"; "Drops Of Jupiter"; "The Chain"; "Jig A Jig"; "Going Home"; "Life Is Life"; "Nine Mile Camp"; "Galway Girl"; "The Celtic Experience"; "England"; "Whiskey In The Jar"
ELO Beatles Forever [ELOBF] recommend both Quill and Cooper & Davies to those enlightened folks who also like ELO, Jeff Lynne, Roy Wood, 'Brum Beat', The Idle Race, The Move, The Beatles and related artistes.